After a couple of attempts that didn't get off the ground due to weather or family obligations, I finally got a chance to hang and fish with Drew Ross, fellow Jackson team member, and fly fishing guru, also known as Looknfishy. With my wife working some extra hours with holiday dance performances, I had to jump though some hoops to get a babysitter for Sunday and Monday, but I was determined to make it happen. After a late night of work Saturday, I had some fun family time, packed up the kayak and gear, and headed out to meet Drew, with the plan of stopping at a local store for some brews. Not long after I got on the highway, I noticed that a) I had no air conditioning, and b) I smelled something burning. To make a long and arduous story much shorter, a pulley in my compressor had seized. After several stops for opinions, and finding a mechanic open on a Sunday, I was able to ask them to cut off the AC belt so that I could still drive, sans air conditioning. I figured that if I was going to be depressed about how much a new compressor was going to be, I might as well do it AFTER getting in some fishing. I was not going to be denied. By this time, several hours had passed, and my game plan was completely out the window for Sunday, but I headed down with the thought of fishing one of the bridges in GI, or just grabbing some brews with Drew before fishing Monday. Due to the time change, I only had until about 5:30 before it would be totally dark. I felt a little better when I stopped for ice, and received $2.25 in change after putting $2 in for $1.75 ice.. Had to be a sign that things were looking up, right?. At about 3:45, I realized I wasn't too far from Bason's marina, and decided to put in for a quick paddle there. I just needed to get in the water for a few minutes, whether or not I caught anything. I knew sunset would be nice, and I didn't plan on going far. After a short paddle, I caught a 14"ish trout in a cut, but couldn't find his buddies. I paddled around a bit just checking out the features, and popped back out into the main bayou with just a few minutes of sunlight left, where I saw birds working all over the place. Casting topwater under the birds resulted in instant hookups, or at least entertainment watching the lure bounce all over the place, but very few legal fish. I played around with them just a bit before taking a few photographs and heading in. At some point, we both acknowledged being a little worn down by catching the small fish, and checked out a bit of new marsh in hopes of bigger fish, with no results. I was pretty much down to my last couple of minutes when I found one slightly bigger slot and a pal of his crawling in some extremely shallow water, and I knew after that fish and the fight that ensued, that I should call it on that high note. After a couple of pics with that fish, I skedaddled on back to the launch, which took a bit longer than I had hoped due to some detours around impassable areas that were high and dry thanks to the strong falling tide. Driving home with no AC sure wasn't great, but the glow of a pretty epic trip helped take my mind off getting blasted in the face with hot air. 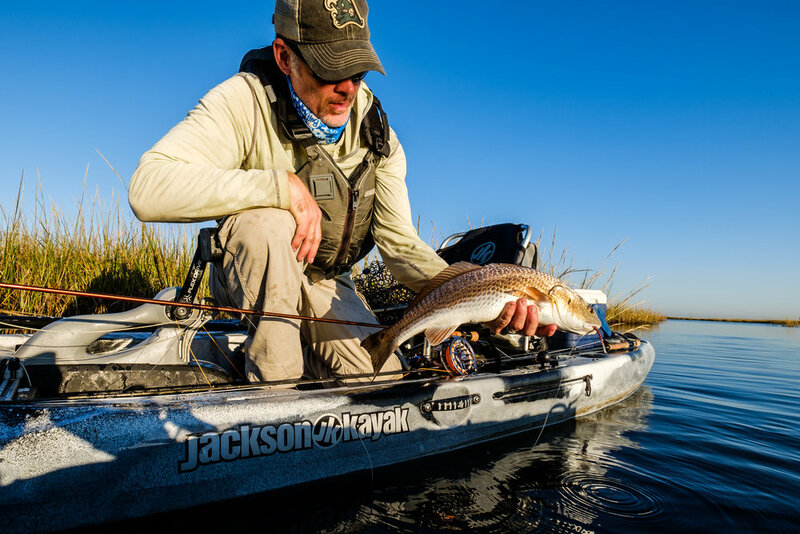 Had some memorable moments on this one, including a bunch of fish caught within 10' of the kayak, running over a few schools, accidentally pulling a redfish up into the marsh grass, and countless eats while sight fishing. Unfortunately, my luck seemed to have changed when I got home, as some sort of mystery ailment seems to have struck the memory card I recorded all of my GoPro footage on, and I have been unable to recover any of the video files. Womp womb, not sure what happened but that's life in the digital ge.